It has high quality pneumatics and guarantees consistent high performance during the entirety of its lifetime. The carrying system features a lightweight and durable carbon space-frame which has been designed for high level of resistance to chemicals and heat. The unit has been developed using materials that are formed and shaped to provide maximum comfort at the waist and the shoulder as well as outstanding durability. 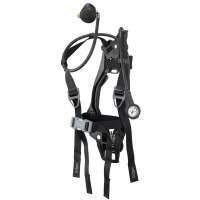 The carrying system has been designed to reduce fatigue, stress and back strain. The inclusion of double rubber coated fabric durability, comfort and chemical resistance, and the innovative and creative binding design guarantees an excellent weight distribution on the user’s shoulders. The entirely integrated hose design means that the hoses can be replaced cost effectively and easily. Both the air supply gauge hoses of the unit are mounted on the space-frame to reduce the risk of entanglement and snagging. This feature enables users to shift the hose position to suit their preference. The Draeger PAS Lite allows users to take advantage of a system that is considered by many professionals to be one of the best breathing apparatus units available today. It uses a single steel or carbon composite cylinder rated between 4 L and 9 L, 200 bar and 300 bar. For those who need a reliable, efficient and cost effective compressed air breathable apparatus, the Draeger PAS Lite is definitely one to consider.